Columbus Day is celebrated on the second Monday in October. On October 12, 1492, Italian explorer Christopher Columbus landed in the New World. 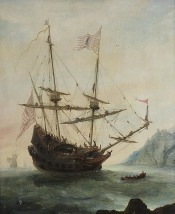 The discovery of America happened before dawn, on October 12, 1492, when the lookout of the "Pinta" shouted "Tierra! Tierra!" In the late 15th century, India was a source of precious spices and other rare goods, but reaching it by sailing east was difficult because Africa blocked the way. Columbus proposed to reach India by sailing west from Spain. This of course presumed that the world was round. Contrary to modern popular belief, sailors and other educated people of the 15th century already understood this. Columbus had a difficult time funding his voyage, not because the experts thought the Earth was flat, but because they calculated how far India was to the west of Spain, and concluded that the distance was far too great. Indeed, if the American continent had not existed, the experts would have been vindicated. Columbus with his tiny ships could never have crossed an ocean as wide as the Atlantic and Pacific combined. After many years of rejection, it was King Ferdinand and Queen Isabella of Spain who finally agreed to provide financing for the dangerous and speculative expedition. Columbus set sail with 90 men in August 1492 on three ships: the Santa Maria, the Nina and the Pinta. After sailing west for five weeks, the expedition reached land on October 12. Columbus believed he had found a new route to India, hence the use of the word Indians to describe the peoples he met. Columbus would make three subsequent voyages and would die believing that he had found a new route to India and Asia, and not, in fact, the gateway to North and South America. Columbus was not the first European to successfully cross the Atlantic. Viking sailors are believed to have established a settlement in Newfoundland sometime in the 11th century, and scholars have argued for a number of other possible pre-Columbian landings. Columbus, however, is credited for initiated the lasting encounter between Europeans and the indigenous peoples of the Western Hemisphere. Italian immigrants were the first to celebrate the holiday annually in U.S. cities where they had settled in large numbers, in part as a celebration of their heritage, since Columbus was believed to be Italian. In 1937, President Franklin D. Roosevelt proclaimed Columbus Day a national holiday, then held every October 12. In 1971, Congress moved the U.S. holiday from October 12 to the second Monday in October, to afford workers a long holiday weekend.